People use an uncontrollable wide range of webmail, desktop and mobile email client applications to view email campaigns. 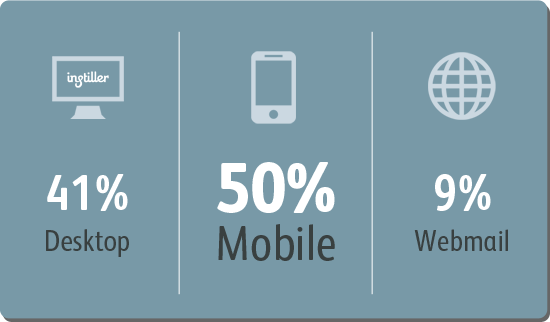 It won’t surprise you to know that on average mobile makes up for more than 50% of the total. It’s always good to know what ‘other’ applications people open emails with but use that information as a way of saving time. Spending time fixing rendering issues in things like Lotus Notes (as an example) that probably never even appear in your email campaign reports is something you can avoid. These analysis results were generated based on a random sample of 300 million emails sent during September and December 2013. Instiller provides reporting down to the specific applications or device used so you can see how many people used Apple Mail 6, Outlook 2010, iPad etc. What people use to view emails varies massively and to see what Litmus currently report as the 10 most popular email clients click here. Working out what email client is being used is all done through the process of tracking opens. In order for the tracking of emails being opened to work, images need to be turned ‘on’. There will always be people that have images turned ‘off’ so that means some figures are not going to be 100% accurate. Have a read of this article to find out more about how email client detection works. What this information tells you is that people use all sorts of different web, desktop and mobile email clients. To help everyone view the content of the message as you intended you need to make sure you’re using responsive email design.